Rose and Her Lily: Camp Joshua North Carolina! Anyways, I am excited to be getting involved in pro-life ministry around the state I live in! I had just been praying recently about getting involved locally, rather than just traveling to other states. Well, now God has answered that prayer. 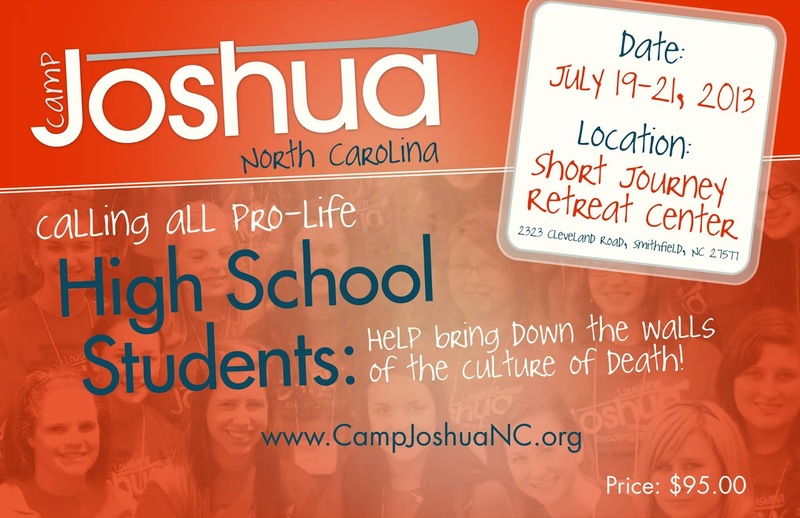 Camp Joshua is a pro-life camp that inspires and equips high-school students to be leaders in building up the Culture of LIFE! It is already around the country, but is coming to North Carolina this summer! The camp will be over the weekend of July 19-21 in Smithfield, NC. I will be speaking and sharing my story, and will also be a counselor there. If you know of anyone else who might be interested in this, please share it with them! Let's get lots of high-schoolers to Camp Joshua this first year in NC! For more information, visit Camp Joshua NC's website: www.CampJoshuaNC.org (If you live in another state, you might like to search and see if Camp Joshua is coming to your community).